registering a jack russell ( full male) with no papers. Can a non paper jack russell be register if they didn't come with papers when born? I would like to get my Jack register but i don't want to get him fixed, and don't have 3 generation information on him? Comments for registering a jack russell ( full male) with no papers. 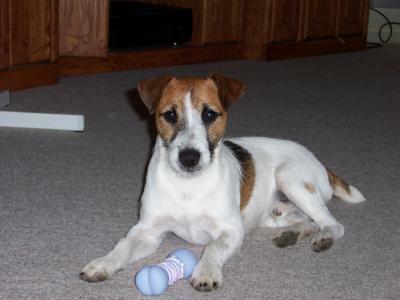 I have a Male Jack Russell 3 years old with no papers. I would like to mate him before I have him fixed. But some JR owners want a Dog with papers, That is understandable. If anyone is ever considering mating with a Male Jack Russel with no papers, I'm in Arizona and my Dog is ready to go. If you read my post you'll see I'm in a similar situation. Due to finances the breeder I bought my Dot from didn't register the litter she came from so my lovely female isn't registered and I'm not sure if the breeder will come through on their promise to help me register her. I was hoping to breed her but most owners won't agree to stud services without registration which puts me in a tough situation. Good luck with your and your handsom fella he's really just darling. "Effective January 1, 1997 a complete four-generation pedigree is required for registration, with five generations preferred if available." It has to do with not wanting inbreeding allowed to slip through into the registry. Sorry Cindy, but what a gorgeous dog.